Plug-in hybrid: the perfect alliance of dynamic capability and efficiency. 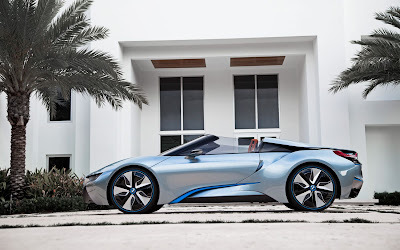 Like the Coupe, the BMW i8 Concept Spyder with eDrive is a plug-in hybrid combining two different power sources and employing the specific advantages of its electric motor and combustion engine to optimum effect. The hybrid drivetrain's key components gel together with outstanding smoothness, allowing it to offer peerless dynamic capability and maximum efficiency. In other words, the open-top two-seater produces the performance of an out-and-out sports machine yet posts the fuel economy of a small car. Interface design aids intelligent mobility. Two large displays inside the BMW i8 Concept Spyder make up the interface between the car, its passengers and the outside world. Positioned alongside the instrument cluster behind the steering wheel, the central information display flags up all relevant information and assists the driver in the use of connectivity applications. A third display shows the automatic climate control settings currently engaged. All the screens display their information in 3D, and the cutting-edge, visually appealing graphics are also impressively clear. Instrument cluster. The instrument cluster displays important driving data using two variable-form ellipses. Positioned alongside the digital speedometer, the efficiency display allows drivers to view how much energy they are currently using – or recovering through the recuperation process. Added to which, the display also contains extra navigation details and information on the car's range when running purely on electric power, its range when powered by the combustion engine alone and its range using both power units in tandem. If the driver switches to energy-saving ECO PRO mode, the display turns blue in colour to signal the shift in functional emphasis, and the ellipses now also vary in form. By the same token, moving into SPORT mode treats the driver to an emotional orange hue. As well as the changes in colour, the displays also provide information tailored to the driving mode selected and to assisting the driver as effectively as possible. Central information display. 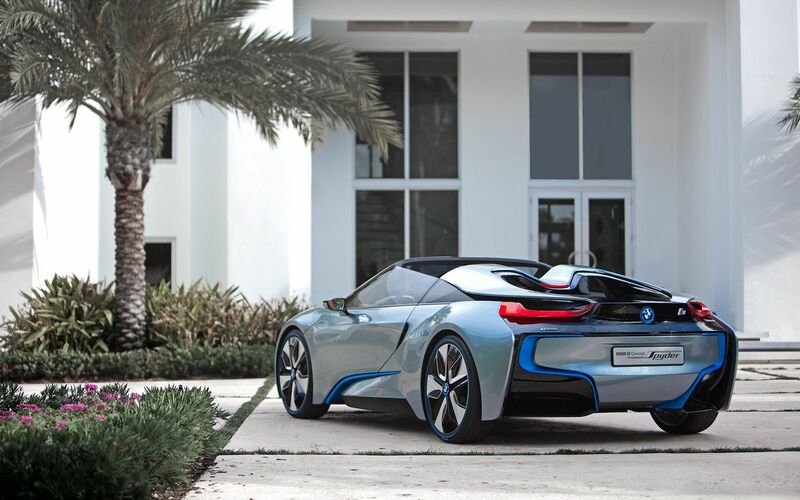 The central information display in the BMW i8 Concept Spyder makes a key contribution to intelligent mobility. It allows the driver to view the current status of the hybrid system, provides a platform for menu navigation and route guidance, and uses innovative connectivity functions to offer drivers a gateway into their lives outside the car. This ensures drivers remain up to speed at all times on how the combustion engine and electric motor are being used, while also being able to monitor the energy flow within the system. Forward-thinking analysis of the driving situation. The car's power electronics are linked up to intelligent navigation and traffic guidance systems to enable the hybrid drive system to work at maximum efficiency. In this way, information on route profile, speed limits and unavoidable traffic congestion are incorporated into the calculations of the energy management system so that the hybrid system's operating strategy can be adapted accordingly. For example, proactive charging of the hybrid battery allows the BMW i8 Concept Spyder to negotiate a traffic tailback on the road ahead using electric power alone – and therefore without producing any emissions. In addition, handy displays such as fuel consumption history allow interesting reflections on past journeys and help to optimise the driving style of the individual at the wheel. Perfectly prepared at all times thanks to diary synchronisation. Intelligent connectivity functions open the door to a host of other practical solutions when it comes to preparing the BMW i8 Concept Spyder for its daily workload. One example of this is automatic diary synchronisation with the driver's smartphone. The system registers upcoming appointments and, when plugged into a power socket, ensures that the battery is topped up overnight so that the car is ready for action with a fully charged battery the following morning. 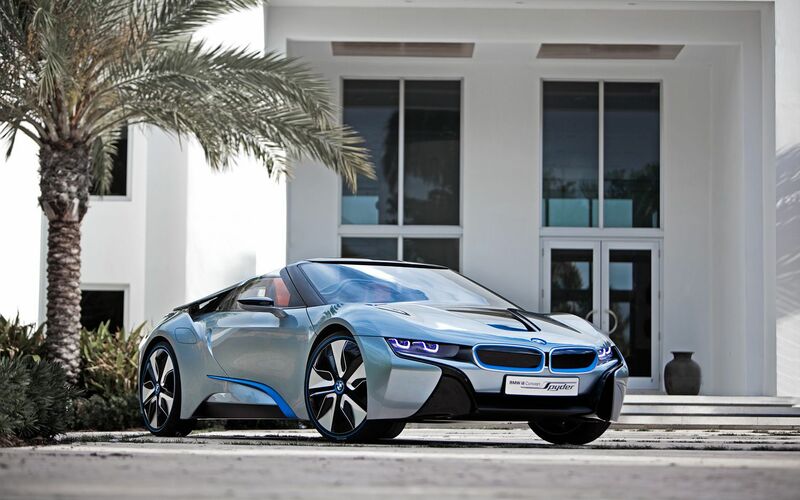 The BMW i concept. BMW i is about the development of visionary vehicles and mobility services, inspiring design, and a new premium perception strongly guided by sustainability. Under the banner of the young sub-brand, the BMW Group is developing purpose-built vehicle concepts which redefine the understanding of personal mobility. Key elements include groundbreaking technologies, intelligent lightweight design and the innovative use of materials, all with the aim of creating vehicles with extremely low weight, the greatest possible range, generous interior space, poised and authoritative driving characteristics, and exceptional safety. 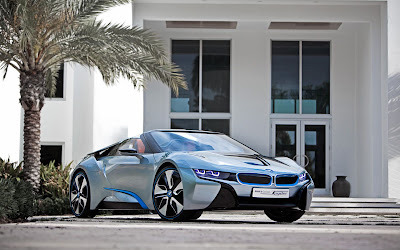 The BMW i8 Concept Spyder follows in the tyre tracks of the BMW i3 Concept and BMW i8 Concept Coupe as the third concept car created under the BMW i sub-brand.